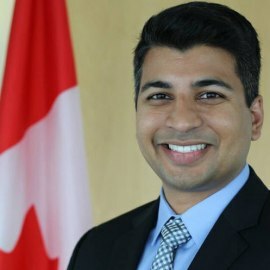 Sunny is currently serving as a Director and the Innovation and Youth Engagement Division (IYED) at the Department of the Environment and Climate Change (ECCC) with the Government of Canada. Environment and Climate Change Canada is the lead federal department for a wide range of environmental issues and has over 7500 employees working across Canada. The IYED team launched in June and is still actively growing and developing programs for the Department. IYED acts as a resource center for experimentation and innovation, serving as a node for horizontal collaboration and capacity-building. The team facilitates new ways of understanding barriers with a view of helping ECCC employees apply new approaches, methodologies and tools such as behavioral insights, experimentation, prize-based challenges, pay for performance or outcome-based programs and user-centered designs to their work. The idea is to better define problems and create innovative solutions that could benefit how the Department works and delivers on its mandate for Canadians, including addressing climate change, environmental enforcement, implementing air and chemicals regulations and protecting species at risk.